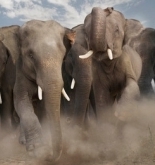 The Elephant Watcher news archive for the month of August, 2011. The race for the Republican nomination for president underwent some significant changes during the month of August: Rick Perry jumped into the race, Tim Pawlenty quit, and the national poll numbers moved heavily in favor of Perry. The primary awoke from the July campaign "dead zone" on August 11th, when the field assembled for its first debate since mid-June. Mitt Romney was able to play the role of the front-runner, remaining above the fray as he had been during the preceding months. Meanwhile, Tim Pawlenty and Michele Bachmann firmly planted themselves in the fray by attacking each other. On August 13th, the Ames straw poll was conducted. Bachmann barely defeated Ron Paul, denying Paul a rare chance to get in the headlines. Pawlenty's third-place finish convinced him to quit the race, the first official candidate to do so this season. That same day, hoping to steal headlines, Perry announced his entry. Almost immediately, Perry leaped to the top of the polls, knocking Romney out of the top spot nationally. In Iowa, Perry took a small lead; in South Carolina, he took a large lead. But in Romney's stronghold of New Hampshire, Perry could make little headway. Political observers reacted to these developments by characterizing the primary as a two-man race between Perry and Romney. Perry's ill-considered gaffes reinforced the existing concern about his electability. The Republican establishment proved receptive to Perry's economic record of job creation in Texas, but the electability issue prevented them from throwing their support behind him. Meanwhile, Romney's support proved soft. Toward the end of August, there was increased chatter--particularly among the Republican establishment--about the need for an additional candidate. Chris Christie made no indication that he was going to enter the race. The Tea Party wing of the Republican Party was heartened by Perry's entry, but Perry did not prove himself capable of uniting the whole of the Party. Christie remained the favorite to win the nomination, though his odds dipped somewhat. Elephant Watcher calculates that Christie has a 57% chance of winning the nomination.